Short fabric waistcoat called giubea, edged with fur worn by a fluier (pipe) maker. 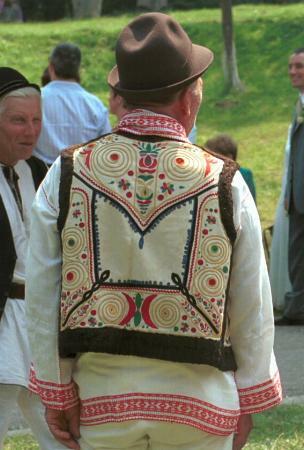 Decorated with red, yellow and green embroidery. The ‘squirl’ patterns are typical of this area of southern Romania. Brown ‘trilby’ shaped felt hat. Photo taken at Astra Museum, Sibiu, August 1998 during a fair of traditional crafts.